This villa near Gareoult (2.5 km) has a very well kept décor and it can also accommodate two families through the separate house attached to the villa. So everyone has their own space! Enjoy the wonderful garden, shaded terraces and a large, enclosed private pool with optimal privacy. 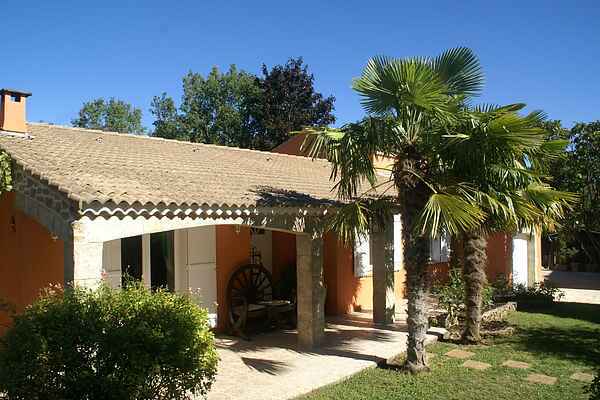 The villa is situated in a quiet and exclusive residential area in the heart of 'La Provence Verte'. The enclosed garden with lawn has several nice seating areas, a pond (fenced) with fish, a vegetable garden and a lovely covered terrace with a BBQ next to the pool. Here, under the grapevines, you will serve extended lunches. The children are reading a book in the hammock or playing table tennis. In half an hour you are at the beaches of the Mediterranean Sea. Visit the bustling harbour city of Toulon (40 km) with the charming weekly farmer's market and then take the boat to the green island of Île de Porquerolles. There are several hiking and cycling trails on this beautiful island. You can smell the scent of mimosa and those delicious Provençal herbs everywhere. The nature here is beautiful. The island is only 7 km long and 3 km wide, so an idyllic bay to cool off is always nearby.